Ishmael is one of those characters that is known in Judaism and Christianity. He is the son of Abraham and his wife’s handmade, Hagar. In the Islam religion Ishmael is considered to be a prophet and actually an ancestor of Mohammad. So not only do we see Ishmael in the Bible, but you can read about him in the Quran as well. For this article, we will use the Bible to look at a character profile of Ishmael. In the Bible we read that God promised Abraham (Abram) that he would have an heir and that, in fact, his seed would be so many that they would be as the stars (Genesis 15). We know this as the Abrahamic Covenant, that promise between God and Abraham. However, by the time God revealed His promise Abraham was already 86 years old (Genesis 16:16) and Sarai (his wife) was also well advanced in age. So, Sarai had the bright idea to take matters into her own hands and have Abraham take her Egyptian handmade, whose name was Hagar. Abraham thought it was a good idea and he took Hagar as his wife. Of course, Sarai regretted her choice and dealt with Hagar in such a way as it caused Hagar to run away. Then the LORD sent an angel to Hagar to announce that she was pregnant with a boy child that she should name “Ishmael”. The angel also told Hagar that her seed would be multiplied “exceedingly, that it shall not be numbered for multitude” (Genesis 16:10). The angel went on to tell her that Ishmael would be a “wild man” and that “his hand will be against every man, and every man’s hand against him” (Genesis 16:12). The boy was born, and Abraham named him “Ishmael” just as the angel had said. As the LORD would have it, when Abraham was 99 years old He appeared to Abraham to remind Abraham of that covenant – to be the father of many nations (Genesis 17). And then the LORD told Abraham that his wife Sarai (Sarah) would bear him a son whose name would be called Isaac. Abraham laughed at this in his heart because he was nearly 100 years old and Sarah was 90 years old. Even so, the LORD said that the everlasting covenant would be through Isaac. But the LORD did not forget Ishmael and indeed blessed him to multiply exceedingly as well. At the time of the LORD’s appearing Ishmael was 13 years old. Now after Isaac was old enough to be weaned from Sarah, Ishmael was seen to be mocking Isaac. At the sight of this Sarah asked Abraham to throw Hagar and Ishmael out of the family. The LORD agreed with Sarah and told Abraham to do as she asked because Ishmael was not Abraham’s true heir, but instead Isaac was (Genesis 21:8-21). So, Abraham gave bread and water to Hagar and sent her away with her son, Ishmael. God was with Hagar and Ishmael and provided more water when their bottle became dry. From that time forward Ishmael was an archer dwelling in the wilderness of Paran (modern day Saudi Arabia) where he married an Egyptian woman according to his mother’s wishes. 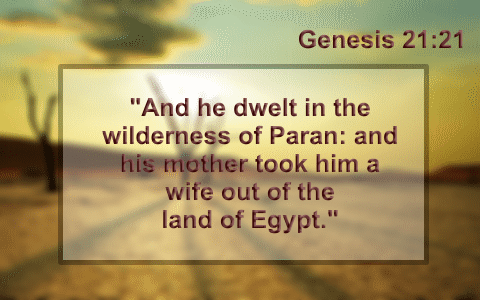 Genesis 21:10–14 Wherefore she said unto Abraham, Cast out this bondwoman and her son: for the son of this bondwoman shall not be heir with my son, even with Isaac. And the thing was very grievous in Abraham’s sight because of his son. And God said unto Abraham, Let it not be grievous in thy sight because of the lad, and because of thy bondwoman; in all that Sarah hath said unto thee, hearken unto her voice; for in Isaac shall thy seed be called. And also of the son of the bondwoman will I make a nation, because he is thy seed. And Abraham rose up early in the morning, and took bread, and a bottle of water, and gave it unto Hagar, putting it on her shoulder, and the child, and sent her away: and she departed, and wandered in the wilderness of Beer-sheba. Genesis 25:9–10 And his sons Isaac and Ishmael buried him in the cave of Machpelah, in the field of Ephron the son of Zohar the Hittite, which is before Mamre; The field which Abraham purchased of the sons of Heth: there was Abraham buried, and Sarah his wife. Genesis 25:12–16 Now these are the generations of Ishmael, Abraham’s son, whom Hagar the Egyptian, Sarah’s handmaid, bare unto Abraham: And these are the names of the sons of Ishmael, by their names, according to their generations: the firstborn of Ishmael, Nebajoth; and Kedar, and Adbeel, and Mibsam, And Mishma, and Dumah, and Massa, Hadar, and Tema, Jetur, Naphish, and Kedemah: These are the sons of Ishmael, and these are their names, by their towns, and by their castles; twelve princes according to their nations. 1 Chronicles 1:29–31 These are their generations: The firstborn of Ishmael, Nebaioth; then Kedar, and Adbeel, and Mibsam, Mishma, and Dumah, Massa, Hadad, and Tema, Jetur, Naphish, and Kedemah. These are the sons of Ishmael. As prophesied in the Bible, Ishmael was a wild man (a man living in the wilderness). He also had 12 sons, in that Ishmael was made “a great nation”. The Bible does not say that Ishmael would be the true heir to Abraham, but instead Isaac would (Genesis 21:12). The debate began way back in Genesis and because of this misunderstanding as well as the added lore of a large and influential religion, wars are fought over who should inherit the land. This only proves that to understand God’s true words, we must study it out, line upon line, precept upon precept. Previous post: What Do You Say To Someone Who Listens To A False Teacher?